This story begins nearly a year ago when Roger proposed to paint our living room a deep red–the kind that some might associate with brothels or blood. 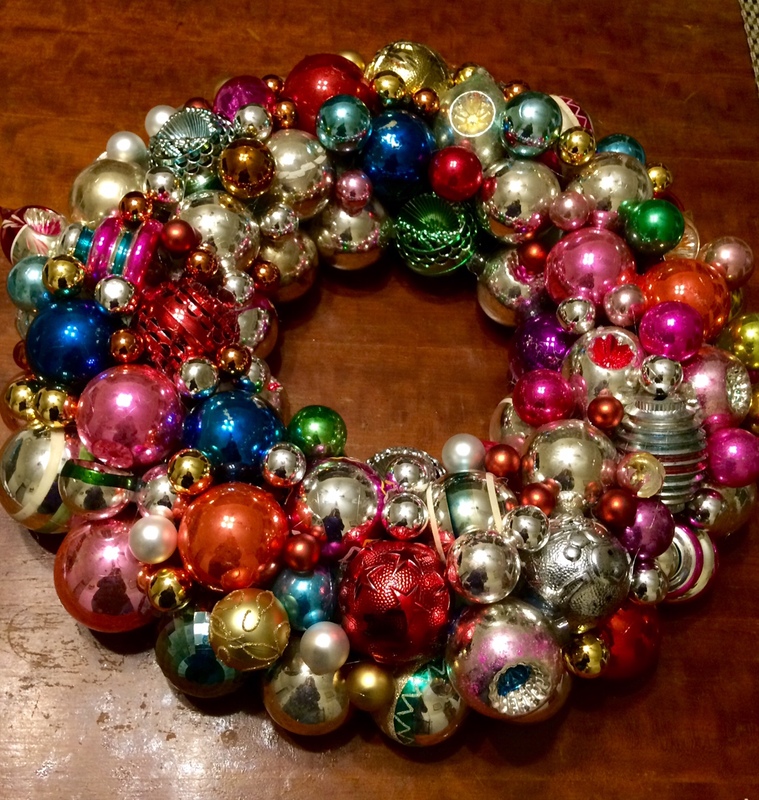 At first, I was firmly against it, but then, I began to think that a red and white theme could be a tremendous advantage in my Christmasy world. I agreed, maybe a little too enthusiastically, because he tried to change the plan. The four-sided snowflake to the far right was contributed by my son, C.J. True to his nature, he said snowflakes did NOT have to conform to the hexagonal shape. Now, with a long stretch of red wall above a white wainscot, I have a perfect empty palette. Too empty. Roger doesn’t want to mess the wall up with pictures. I had to wait until he went on his annual hunting trip to put my secret plan into effect. 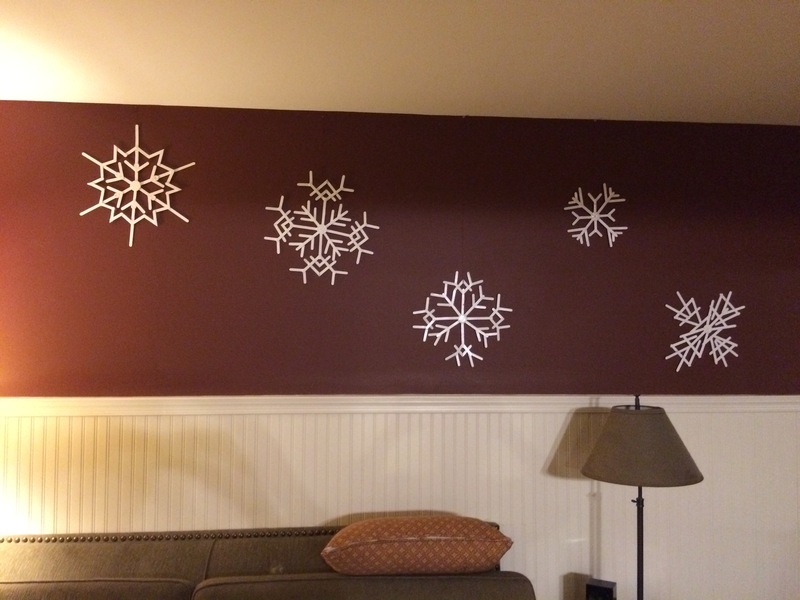 I had seen some popsicle stick snowflakes on Pinterest and envisioned a wall of giant falling snow for the entire winter season. With red and white tree and house decorations, I would have “House Beautiful.” Photographers line up at the door. 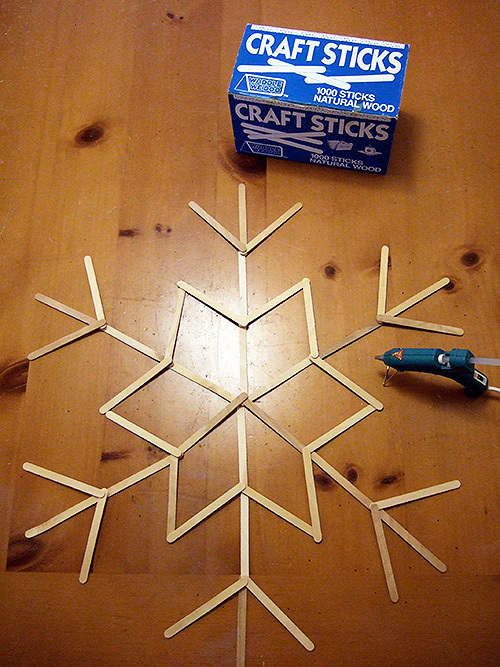 Popsicle stick snowflakes, purportedly easy enough for a child to make, are little devils. They are a little more delicate than I expected, and I found myself making some routine repairs throughout. The symmetry was difficult, too. Cutting and matching them was just a little more exactness than I usually have. (I could have benefitted from a pencil and a sharp knife to measure and cut more carefully–I am sloppy in that area.) I spray painted the first two but that was messy. The last five or six were painted with craft paint and a brush. Much better. My friend Lauren suggested that I add whimsical large and medium white buttons as the center and linking joints of some. I wish I had read Amy Bellgardt’s blog before I started. Her tutorial is excellent, and she had some of the same experiences with cutting the little buggers that I did. I love that she wrote, “And the whole angle thing was irritating me and turning a project with elementary school level crafting materials into a college level course in bad attitude.” Her step by step directions would have saved me a lot of cussing and experimenting. 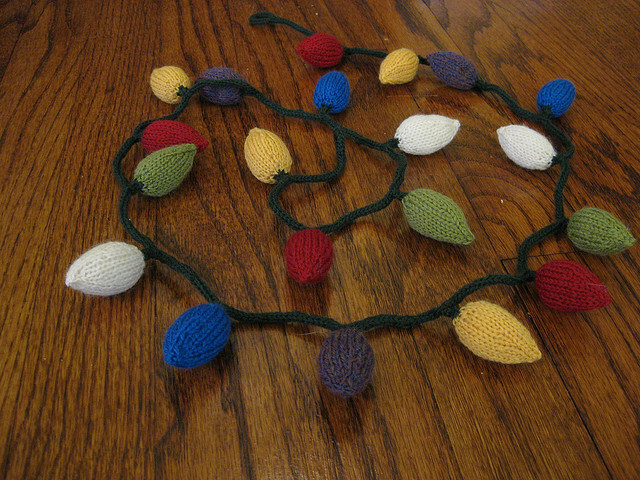 If you are thinking about trying these, hanging red, blue or green snowflakes against a white wall would work just as well. Choose the color to match your house decorations. Even when Christmas is over, the snowflakes can “hang around” through January and February. Right “on time” our Christmas cactus is blooming, as it has the past three years since our neighbors, Greg and Luci, presented the seasonal gift to us. Although we profess to be gardeners, I can tell you that I have a long history of killing anything green and growing indoors, except for the standard philodendron. I did a little research, and found that the Christmas cactus is one of the Schlumbergera (say that three times) genus of cacti, growing in the coastal mountains of south-eastern Brazil. There is a second type called a Thanksgiving cacus, that blooms in the fall, and a third, Easter or Whitsun cactus (blooming at Easter). 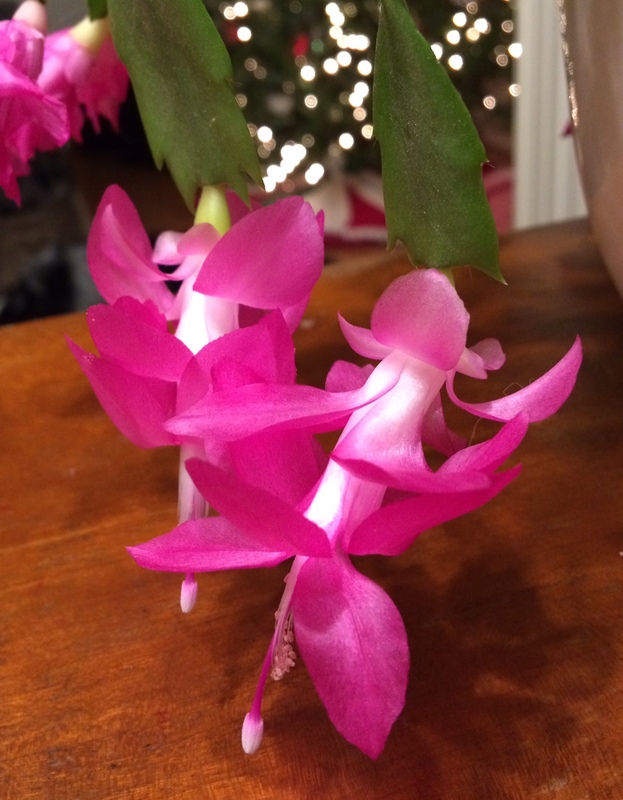 On the linkedwebsite, someone posted a question about why her Christmas cactus blooms near Thanksgiving, and that’s when I learned there are two types! The cactus needs the shorter days with less light to inspire the blooming period to begin. In my experience, they survive largely on neglect (That’s why we are Master Cactus Gardeners.) and a little water. I read extensively about how they should be watered every 10 days and thrive on humidity, so I guess Roger does a lot more behind-the-scenes care than I knew. 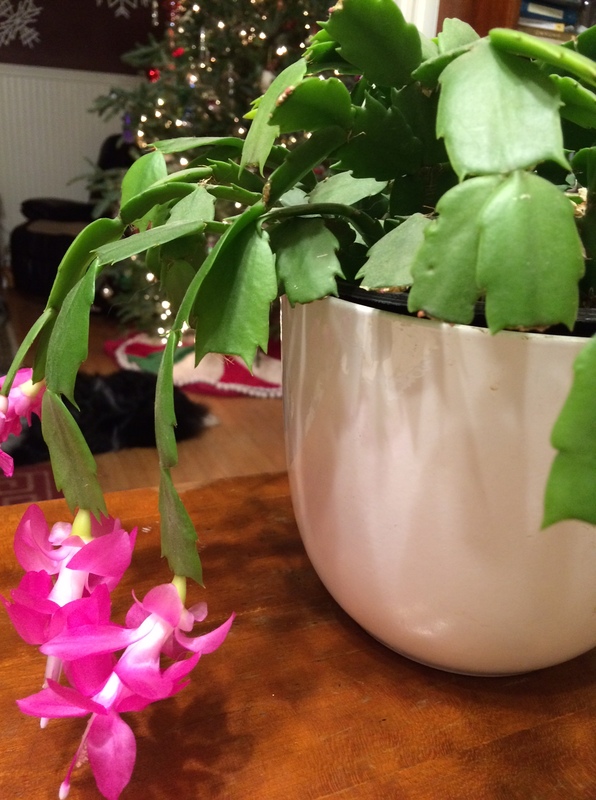 I have linked to a great description of how to propagate the Christmas cactus. I will have to wait until the early spring to do this because the plant should not be actively blooming. Jeremy likes to give “to do” advice, so my “to do” advice will be to look for a good sale on holiday gold or silver pots/buckets in January. Or stock up on gold or silver spray paint. Also, look for the end-of-holiday Christmas cactus that needs some love. I’m going to set a reminder on my calendar to try propagating the Christmas cactus in April. That’s going to be an adventure, and it will make a terrific personal gift next year. Maybe I’ll give a “baby” to Greg and Luci! Podcast #63- 275 Days to Go! Podcast #63- 275 Days to Go! https://theyulelog.files.wordpress.com/2014/03/32414.mp3Click here to listen to this week’s podcast- Teens & Spiders! 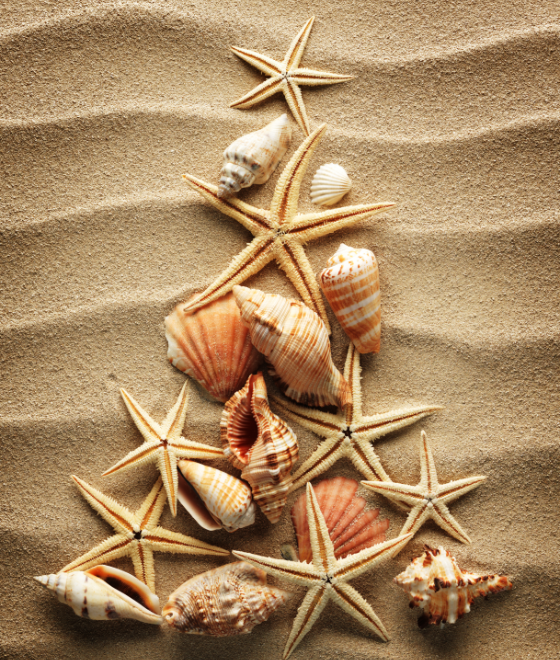 This week Natalie & Jeremy cover a strange range of Christmas topics. 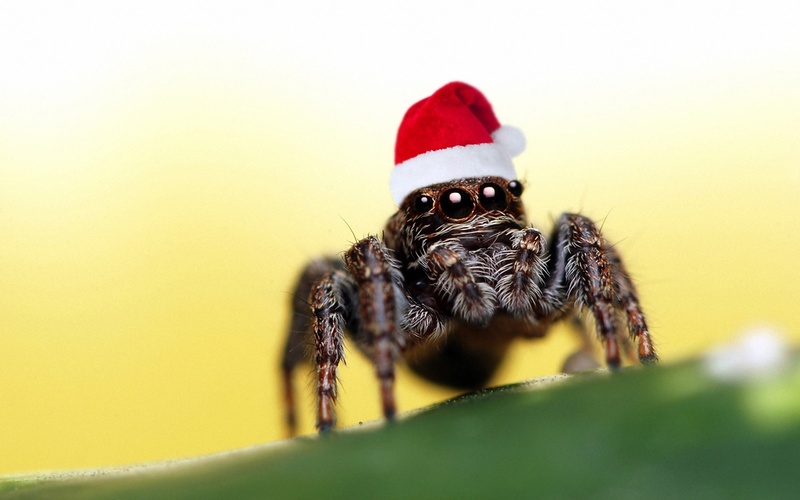 We start with the legend of the Christmas spider (some get rich slow ideas here). We then move to some discussion on our trees, teapots, old ladies, and a plan. 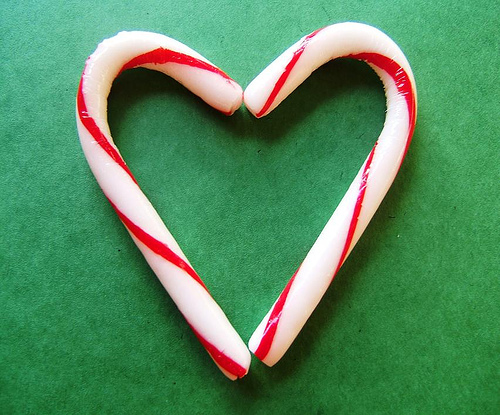 We wrap up with our actual topic for the show- Teen Gift Giving. How do you shop for those 13-19 year olds in your life? What are the best gifts? Is it a mini-fridge? A book? A gift card? Heck- maybe it’s a spider! !